Walking through the passage underneath Turnul Sfatului, you will come to Piata Mica (The Small Square) which you will notice immediately is anything but small, and is not exactly square either. It is delightful though: much quieter, shadier and simply more peaceful than its busy neighbour. It’s home to some great cafes, restaurants and bars, as well as museums and historic houses. In the middle of the square is Strada Ocnei, the main street to the lower town, which passes under the wrought iron Podul Minciunilor (Liars’ Bridge), so called because of the ne’er-do-wells and cheating merchants who would, legend has it, gather on it. To make sure you do not miss anything, take a stroll around the square in an anti-clockwise direction starting at the tower. The first building (the yellow one) is the Old Town Hall, followed by a number of small, mainly 17th century houses, many of which now host restaurants and cafes. All are remarkable for their loggias, a stark contrast to the straight lines of Piata Mare. The most attractive is the house at No. 26, built in 1568 and shortly afterwards opened as the city’s first chemist’s shop. It is today home to a hostel and to the unique and surprisingly interesting History of Pharmacy Museum (see Sibiu’s Museums). The bright, salmon-coloured and somewhat haphazard house at the end of the row (home to a great cafe and bar) hides behind it the Pasajul Aurarilor (Goldsmiths’ Passage), a narrow set of stairs that lead down to Piata Aurarilor in the lower town. From here head for the wonderful Casa Artelor, one of the oldest in Sibiu (it is first mentioned in documents from 1320, as a butcher’s). Its sublime loggia is topped by a relief of Sibiu’s seal, added in 1789. The house is today the Astra Traditional Folk Civilisation Museum, hosting an exhibition - amongst others - of textiles from around the Sibiu region (see Sibiu's Museums). Crossing the Podul Minciunilor (on which everyone appears to stop halfway for a photo) you reach the other side of the square, a long row of houses that curves around leading back to the Town Hall. The house on the corner, the 16th century Casa Luxembourg, is one of Sibiu’s finest, having only recently been renovated and opened as a hotel. The Atrium Cafe on the ground floor hosts regular live concerts and plays. Look out next for the five tiny windows (so thin they look like pillboxes) embedded in the roof of the orange house at No. 12. There is a very good Tourist Information Office on the ground floor, while a pub operates in the basement. The Franz Binder Museum (see Sibiu’s Museums) occupies No. 11, known as the Casa Hermes. The house is also the headquarters of the Astra organisation, which operates the museum, as well as the Astra Village Museum complex and a couple of others in Sibiu. The building, constructed from 1865-7 is something of an oddity on Piata Mica, its linearity and lack of loggia making it stick out like a sore thumb. From here, four cafes and restaurants all in a row occupy 16th century houses, which lead to the Town Hall. 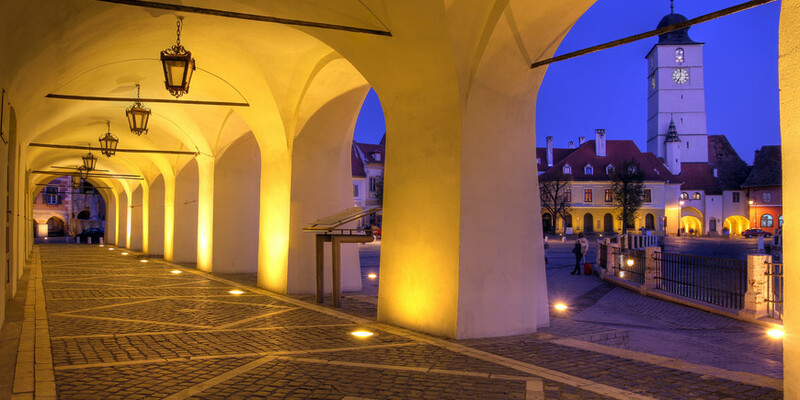 Turn right and in a few steps you will be in the third of Sibiu’s Old Town Squares, Piata Huet.